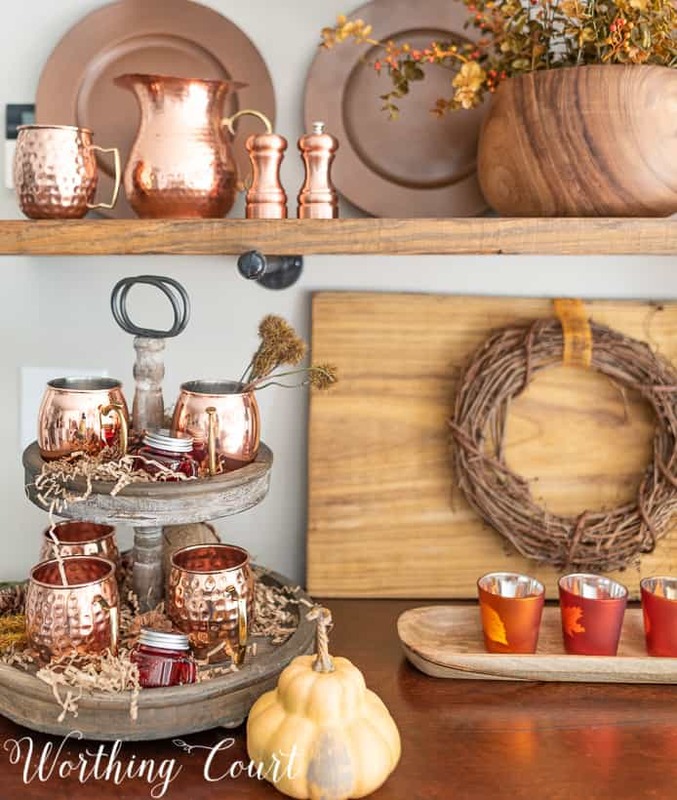 Fall is all about creating warm, welcoming spaces in your home and that’s easy to do when you add copper accents to your fall decorations. 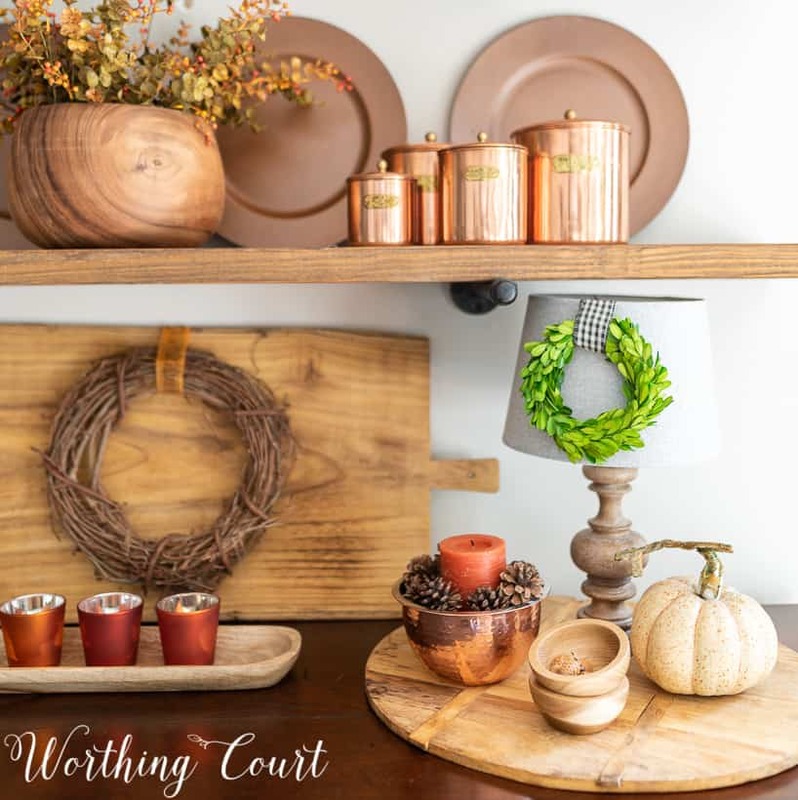 There’s no mistaking what season it is in my breakfast room here at Worthing Court! I went a little bit wild with copper accents on the open shelves in my breakfast room this fall and love how instantly cozy the entire space feels now. SCROLL TO THE BOTTOM TO TAKE A VIDEO TOUR OF THE ENTIRE SPACE! The open shelves in my breakfast room are truly a focal point that can be viewed from the family room and the kitchen so it’s important that what I use to decorate them with ties into the rest of the seasonal decor in my home. 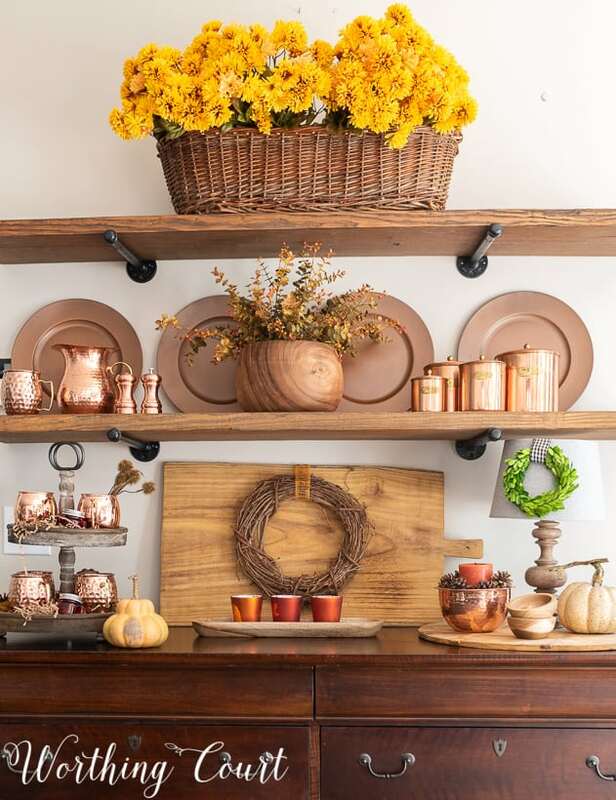 In addition to all of the copper accents, I threw in some wood pieces and light copper colored mums and now I have the perfect recipe for my favorite look this time of year! I’ve been keeping my decorations on the simple side throughout the rest of my home, so these open shelves are probably the most elaborately decorated spot in my entire home this fall. 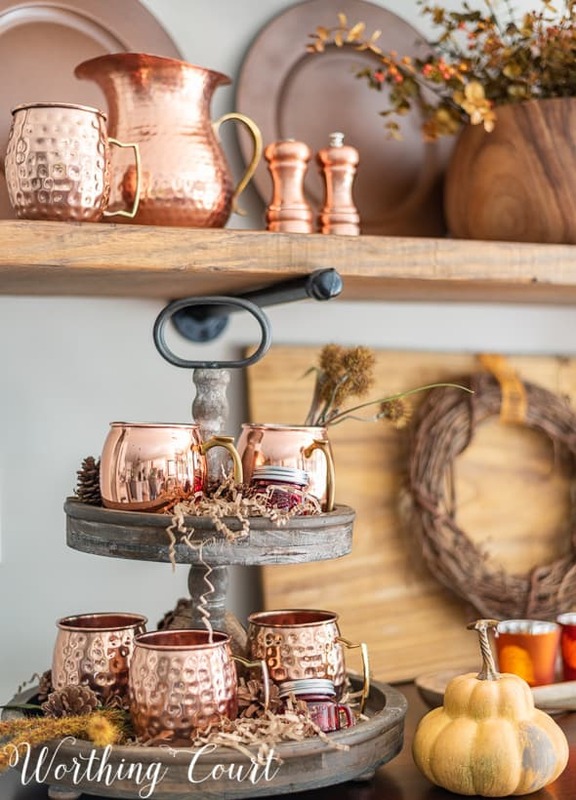 I was able to keep my cost to a minimum by careful shopping, borrowing some copper decor from my daughter (the vintage canisters and some of the Moscow mule mugs) and using items I already had on hand. I don’t care for the look of a lot of blank wall space at the back of my open shelves, so I always add some sort of accent against the wall to help fill the emptiness. For this display, I spray painted some very old, gold plastic chargers with dark copper spray paint and leaned a large bread board against the wall in the lower section. The bright copper really pops against the dark copper chargers and the grapevine wreath that I attached to the front of the bread board (using a piece of ribbon and a thumbtack) adds some much needed texture. With all that’s going on on the shelves, I certainly don’t need anything too fussy on the kitchen table. I simply filled my reproduction vintage toolbox with a few copper colored candles and a few fall picks that include all of the colors that I’ve used in this space. Super fast and easy! 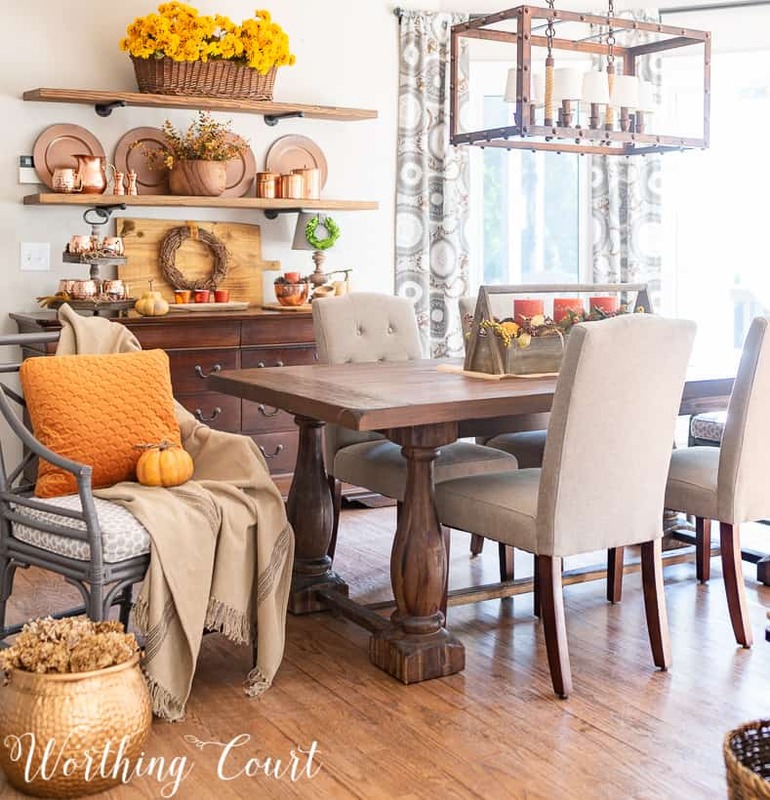 Just love that bright autumn look, especially the wreath on the lamp shade. Have a lamp on one of my kitchen counters – now in search of a small wreath. Thank you, Carol and I’m glad you found an idea! Love the display. I am getting ready to have two floating shelves made for my breakfast room. How do you get your plates to stand up against the wall and stay in place without plate grooves in the shelves? Thank you, Tamra. That’s a really good question! The plates (and anything else that I place there) are just leaning against the wall, but I always make sure to put something in front of them so they won’t fall over or slide down. Hope this helps! 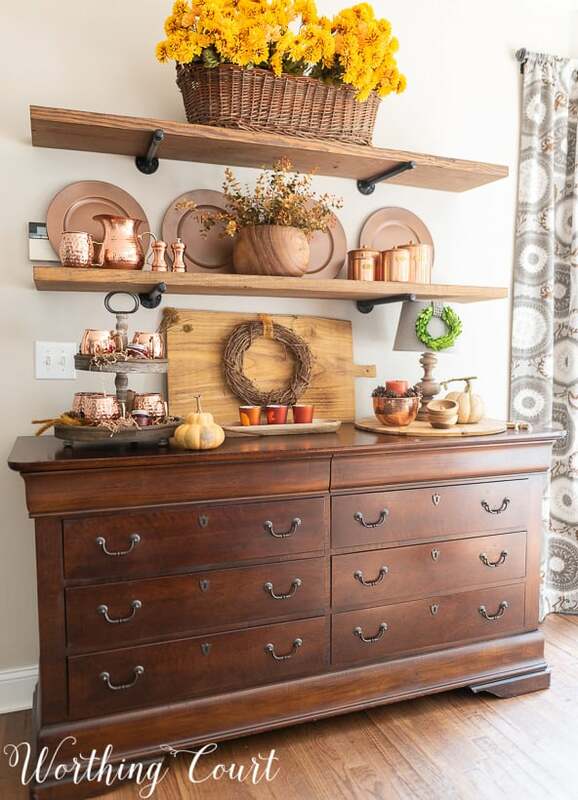 Love all the wood and warm colors of the copper. Such a welcoming cozy room. So happy to hear that – thank you! Alright, SuzyQ. 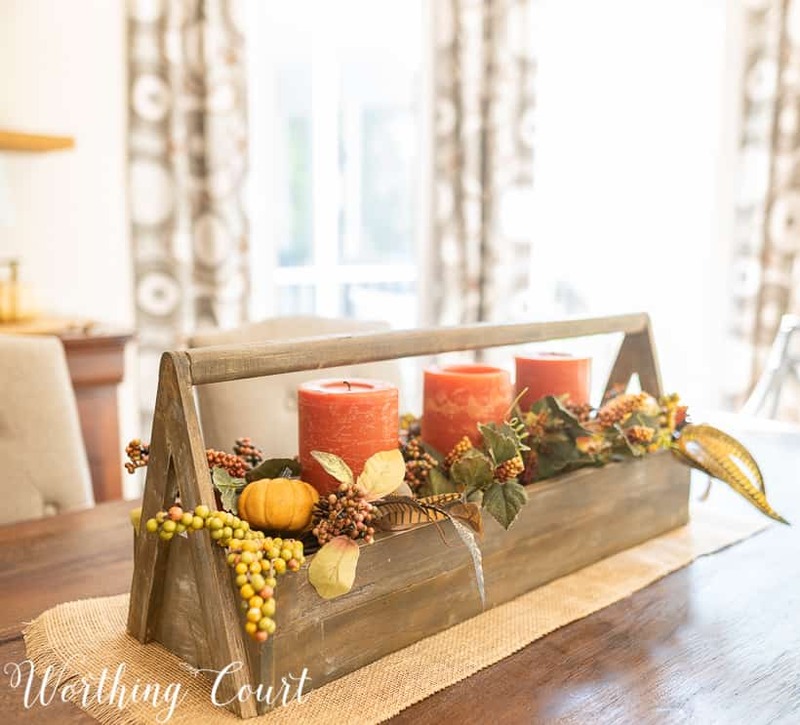 When did you get a job as a photographer for the Pottery Barn catalog, because every single one of these shots looks like it could have been ripped from the pages of one. I LOVE IT ALL SO MUCH!!!! Copper is my signature color these days, so you called my name with this post. Oh my goodness, sweet friend. You just made my day – thank you! Happy fall to you too! I’m so happy that you found some inspiration, Wanda! 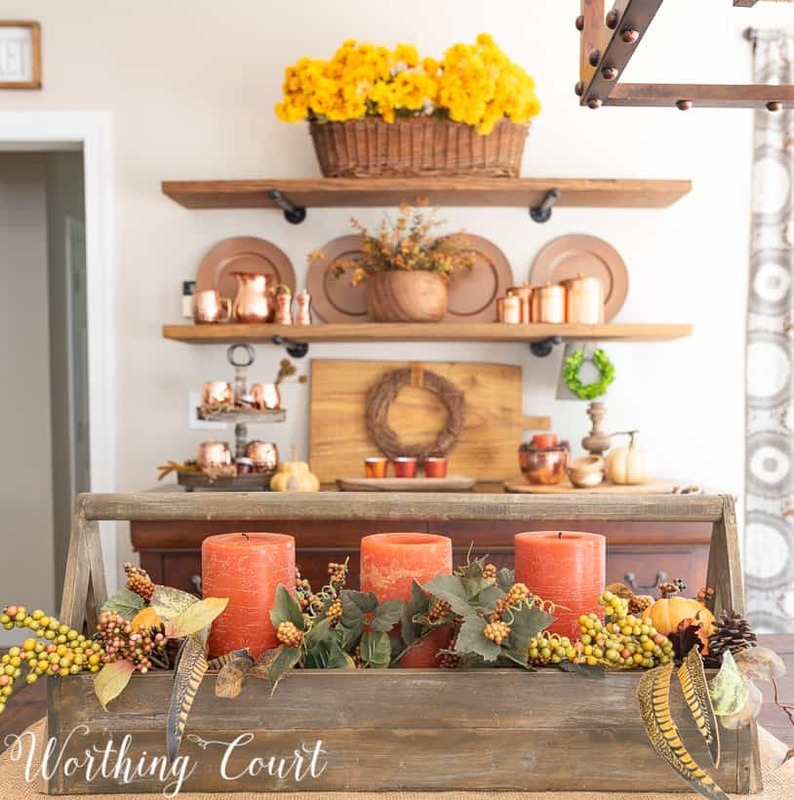 Hi…I am wondering where you purchased your shelf brackets? THank you! The copper and the wood look so good together! So pretty! Here from The Scoop. Thank you and thanks for stopping by for a visit!